This single CD reissues all of the music from two LPs titled Soul Summit and Soul Summit, Vol. 2. 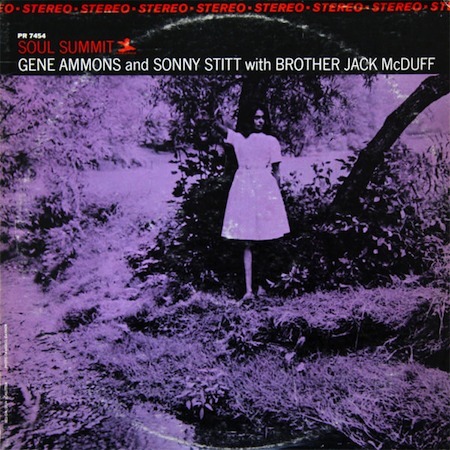 The latter session is one of the lesser known of the many collaborations of tenors Gene Ammons and Sonny Stitt, who are joined by organist Jack McDuff and drummer Charlie Persip. Their six performances are primarily riff tunes with "When You Wish upon a Star" taken at a medium pace and "Out in the Cold Again" the lone ballad. The second half of this CD features Ammons on two songs ("Love I've Found You" and a swinging "Too Marvelous for Words") with a big band arranged by Oliver Nelson, jamming "Ballad for Baby" with a quintet, sitting out of "Scram" (which stars McDuff and the tenor of Harold Vick) and backing singer Etta Jones on three numbers, of which, "Cool, Cool Daddy" is the most memorable. Overall, this is an interesting and consistently swinging set that adds to the large quantity of recordings that the great Ammons did during the early '60s.